The Kokanee Cottage is tucked into a quaint and quiet neighborhood on Bend's popular Westside. Walk to local craft breweries, restaurants and boutiques from this charming Craftsman-style two-bedroom home! 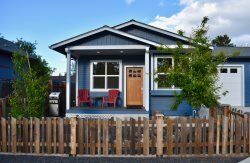 The Kokanee is a fully restored craftsman bungalow with beautiful hardwood floors, an open living and dining area as well as a large, fully-equipped kitchen. The south western exposure provides plenty of light in the open layout. Perfect for active guests, the cottage features a full-sized washer and dryer, one-car attached garage and an on demand water heater. The wide front porch is perfect for watching the day go by - Bend style. Grab a local craft beer and cook on the BBQ to enjoy an unforgettable evening with family and friends! Other amenities include WiFi, BluRay player, cable TV, and Bluetooth sound bar. The 1 Master King and 1 Queen Bedrooms have brand new comfy beds with European style down bedding, fresh and clean duvet covers and high thread count linens. The two bedrooms share a full-size bathroom with organic products provided. Need more space for a bigger crew? The Kokanee Cottage has two bedrooms and sleeps 4. The Hummingbird Cottage next door has one bedroom and sleeps 2. Both houses can be booked together, the full property sleeps 6. * Additional Rates apply for the separate one bedroom - Hummingbird Cottage. Take a stroll through the charming Westside neighborhood to 10 Barrel Brewing Company, Nancy P’s Bakery, Chow (the locals Fav! ), Kanpai Sushi, and Backporch Coffee. Kids will LOVE Harmon park and the “tug boat” playground just around the corner on the Deschutes River! From there, it's an easy walk over the quaint wooden bridge, through Drake Park and into downtown. It appears that house recently renovated and upgraded. Very clean. Nice area. All we needed for food prep, storage, bbq, etc was all there. Off street parking available. Front porch and chairs inviting. Very nice place. One of the best places weve stayed. The perfect cozy vacation bungalow! Great location. Great house in the heart of old mill district. We were able to walk to our concert at Les Schwab Amphitheater and to some great breweries near by. House was very comfortable and cozy.